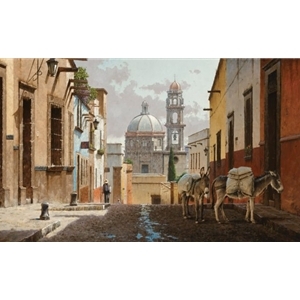 Founded in 1542, San Miguel de Allende is one of the few towns in Mexico to be designated as a national monument. The city's major attractions are cobble-stone streets, tree-lined patios, and beautifl churches, along with its spectacular views. The city is also a mecca for artists and tourists. Climbing its steep hills, in a region of arid sierra, San Miguel is Mexico's answer to a storybook village. One morning, I came upon this extraordinary vision of a church that seemed to rise out of the street. 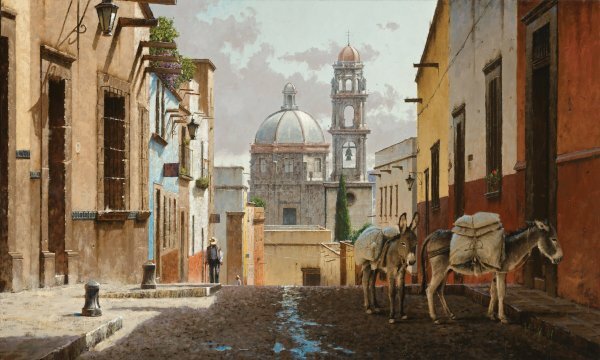 Buenos Dias San Miguel. This outstanding work received the Artists of Distinction Award at the Quest for the West Art Show and Sale at the Eiteljorg Museum this year. With this prestigious award, Hallmark will also be featured in a one-man show at the 2011 event.